Just been into asda to get bananas and saw these on offer for £3.00 a tin (725g) they had loads, also some cadbury tin/boxes biscuits had been reduced to £3 to, not sure if nationwide maybe store specific. Worth a look!! I seem to remember a £1 voucher floating about for these as well, from the McVities points site. 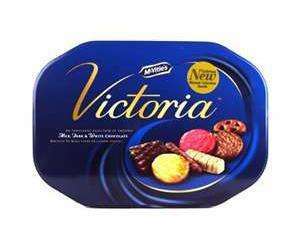 Yes your right sickly sweet, if you can get that, even better, £2.00 a tin cant be bad! Thanks for the heads up will have a look tomorrow cheers. Definitely store specific as I've been to Asda this morning and they were still £5. Do you just scan the barcode on the voucher when paying? They are also £2.99 at B&M Harpurhey Manchester (My Asda were still £5). Have noticed some tins have the £1 voucher in and some don't. Can use the vouchers in any store. Good price, hot.